Nut or seed butters are a great way to add a nutritious boost into your daily intake. They are a good source of many nutrients like calories, protein, fiber, as well as micronutrients. Nut or seed butters can be especially important for little ones that are too young to eat nuts or seeds for safety reasons or have small stomachs so are unable to eat and benefit nutritionally from a large quantity of nuts or seeds at one time. But once you have some nut or seed butter on hand, you can use it in a myriad of ways for yourself or your family. This includes smearing nut or seed butters on whole grain crackers, apple slices, vegetable slices and toast, mixing into oatmeal, pastas, and making sandwiches and baked goods with it. Nut or seed butters can be mixed into baby foods or smeared on soft vegetables and fruits for older infants who are getting a grasp on eating solid foods too! Store bought nut or seed butters are good alternatives if you don’t have time or kitchen equipment to make your own. They are just a little expensive (in my opinion) and it is easy to run out, especially if you use it quite a bit in baking. But if you buy seeds or nuts in large quantities from the bulk bins at large grocery stores, you will likely save some money. You can also control the quality of the nuts or seeds that go into your nut butter, and lessen the chances of using nuts that are old or rancid. What if you have never made nut or seed butters at home before? Don’t worry, it’s easy. It just takes a little time and a blender or food processor. Read these 5 tips below to help you get started and make your first try a success! For the best and most flavorful aromatic results, buy roasted unsalted nuts or seeds to use in your homemade butter. You can also buy raw unsalted seeds or nuts and simply roast them yourself. To do so, preheat the oven or toaster oven to 350 F (177 C) first. Then line a baking tray with aluminum foil, before spreading nuts (or seeds) on top in a thin layer. For almonds, cashews or peanuts, generally you would want to toast about 8-10 minutes on each side. For pumpkin seeds or sunflower seeds, this may be shorter (about 5 -7 minutes on each side). Generally the smaller the seeds, the less time it will take to roast them. The quantity also matters. If you are roasting a large amount at once time, then expect it to take longer for all the nuts or seeds to be toasted. The same applies conversely. Also I find that toaster ovens seem to roast or toast nuts and seeds much faster than using conventional ovens so keep this in mind. No matter which method you use, just keep an eye on what you are roasting and take them out once they are lightly golden. When making your own home nut or seed butter, it helps the process of blending nuts or seeds when you add a little bit of oil (and a little love of course…). Depending on the amount and quantity you are making at one time, this could mean a tablespoon or two of a vegetable oil of your choice. For the best results, use a neutral tasting oil like canola oil or sunflower oil. In my experience, I have found canola or sunflower oils work really well in making smooth creamy nut and seed butters, though you can experiment with other vegetable oils (e.g., peanut oil in making peanut butter) if you like. Adding a little oil will also contribute towards a faster blending time and a creamier final texture. If you want a chunkier texture, then add less oil and pulse the mixture less in the food processor. You can also reserve about a quarter cup of the nuts or seeds of choice to add in right at the end (just pulse once or twice quickly) if you want to have some chunky bits left in your nut or seed butter. Note that even if you add some oil in with the nuts or seeds, it will take a little time to get the texture you want. Generally, the longer you blend or pulse the contents in the food processor bowl, the smoother and creamier the texture of the nut or seed butter. This is from a combination of the mechanical action of the grinding as well as from the generated in the process. But don’t keep running the food processor continuously! Pulse for 30 seconds to a minute at a time, then check the consistency of the contents, and scrape down the sides of the food processor bowl if needed. This will let the machine rest a little bit as well, and prevent the food processor machine from overheating, making it unusable for a period of time. The rubber spatula I bought at a Dollar Store has been the best investment I’ve made in my kitchen. And it has proved itself again when I am making nut or seed butters. I use it to push down the food processor bowl contents between pulses, and to scrape out every last ounce of creamy nut or seed butter goodness from the crevices of the food processor bowl into the glass mason jar. If you have a rubber spatula, use it. You’ll be amazed at how much it will help you in this process! The temptation to use and assess the nut or seed butter you’ve made on the spot can be great but wait a little. Although it is important to make sure the homemade butter consistency and creaminess is the way you want it before you remove it from the food processor or blender, wait to judge it. Taste a bit if you like and use some on the spot but let the rest sit in the fridge at least overnight. Then taste it the next day or two. You may be surprised. From my experience, I often find the homemade butter tastes better after it has had time to sit for a while. There seems to be a better blended flavor and a slight richness in depth that comes out from ‘mellowing’. Try it and see if you notice it. Here is another reason to ‘let it sit’. When first made, a nut or seed butter will feel hot to the touch and of a thinner consistency. However, once you let the homemade butter sit in the fridge a few days, it will gradually thicken in texture. A homemade nut or seed butter stored in the fridge can be used for a few months. If you make any extras, you can freeze that in a freezer safe container (I use a lidded glass mason jar) and then just take that jar out to thaw when you need it. Remember, the sky’s the limit! If you make your own home nut or seed butter, you have the chance to experiment and try all sorts of different combinations. 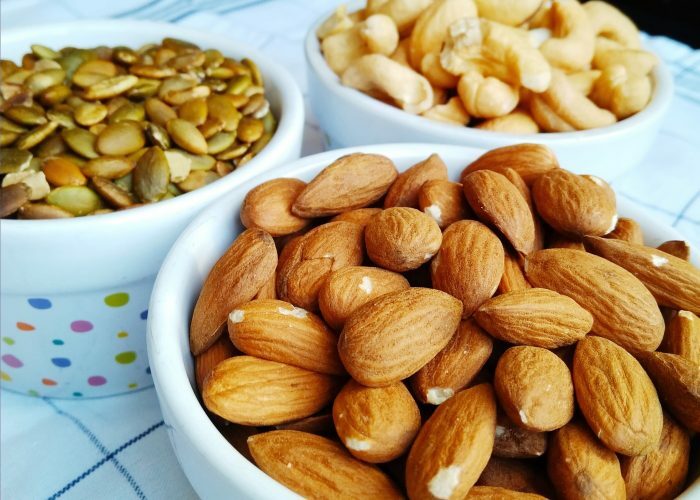 Try mixing in a combination of nuts and seeds, two different nut types together, and even add in some spices (some examples are nutmeg, cinnamon, pumpkin spice, vanilla essence or cayenne pepper for a spicy kick). You might create a blend that you and your family really enjoy (like we did). That’s one of the best benefits in my mind of making your own nut or seed butters. You have the chance to make it really unique and customize it to your own liking. Happy blending!